The passing of Karl Lagerfeld has brought the utmost sadness to the fashion world. However, his dedication and marvellous work will always be remembered. Karl had actually been with Fendi for 54 years starting from 1965. To the last days of his life, he was still working on adding some notes from his bed in preparation for this season’s Fendi Women’s Collection. Sketches of the collection were drawn by Karl Lagerfeld himself. 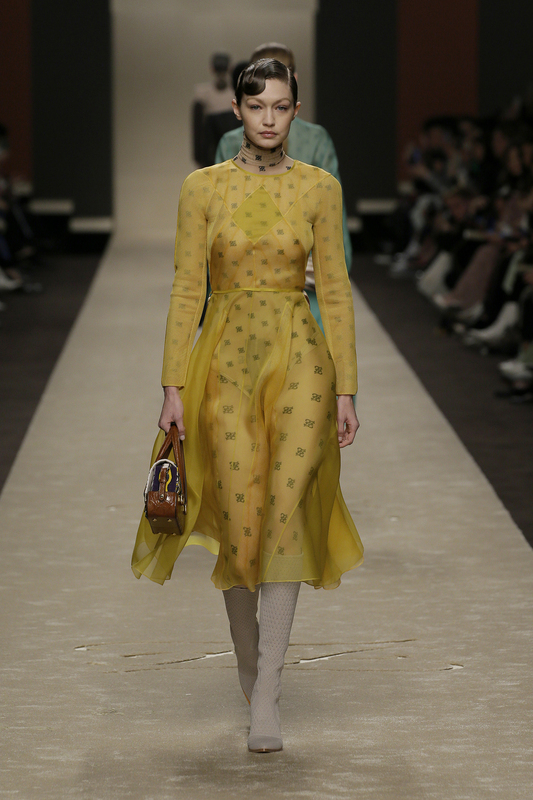 “When we called just a few days before the show, his only thoughts were on the richness and beauty of the Collection. It’s a true testament to his character. He shall be so missed.” said Silvia Venturini Fendi, the creative director for accessories and men’s lines. Karl was bringing his sketches to life through his final Fendi gesture and the highlight of the collection, the romantic trace of silk foulard. Revealing each of his masterpieces, it is truly and forever his own. The silhouette is defining simplicity in a yet majestic way. Neutral tones stand out among the pale ivory tulle as well as making the wallpaper prints strikes on organza and satin. Pointed shirt collars button high along with cotton poplin and fine leather in Karl’s unsurpassable style were paired with full pleated trousers and jacket pockets, while the ever famous FF “Karligraphy” appeared on cabochon buttons and intarsia fur. 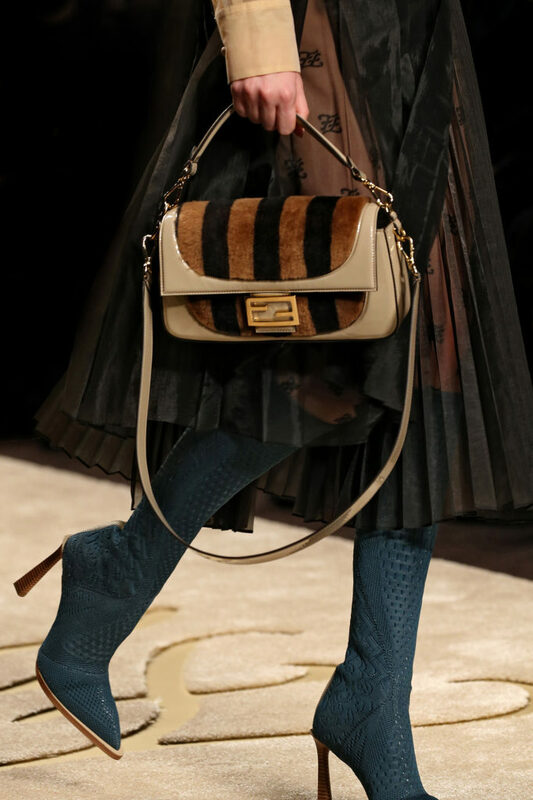 For this season’s accessories collection, the famous Baguette bag is modified into an embossed pillow patent without removing the FF jacquards. A special shiny metal tote bag is also trending on this season. Not to forget the high heels and boots are adorned with a high knee knitted neoprene. 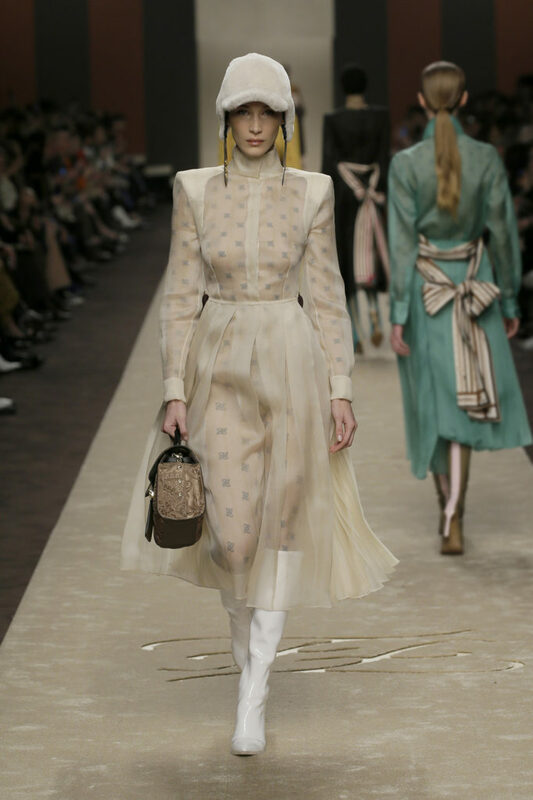 The Hadid Sisters, Bella and Gigi, walked for this season’s Fendi Women’s Collection along with other high profile models such as Kaia Gerber, Adwoa Aboah and Adut Akech. At the end of the show, Fendi paid tribute to the late designer at Milan Fashion Week by airing a part of Loïc Prigent’s 2013 documentary, “Karl Lagerfeld Sketches His Life,” while Silvia Venturini Fendi took her bow. “The bond between Karl Lagerfeld and FENDI is fashion’s longest love story, one that will continue to touch our lives for years to come,” she added.